But I’ll give ten Myrmecos (™) points to the first person who can identify what species it really is. Close, but floridanus is a bit hairier than this ant. Either Camponotus sayi or Camponotus decipiens. Lousy pic. Bingo! Ten points for you. It isn’t clear from the picture to say for certain which of those two it is. I *think* it’s sayi, but decipiens would also fit. I’m well outside my geographic area of expertise here, but Camponotus discolor? Very close, but discolor is also hairier than this ant. I like C. decipiens for this ant, becasue of its rather chinky head. The major of C. sayi has a somewhat less robust head. C. snellingi is out because of the lack or red or yellow on the gaster. Thanks James. I figured you’d have the most insightful comment of anyone. 1) Latrodectus – not a bug…and certainly not poisonous. 3) Loxoscelese bite – are we sure that isnt a necrotic infection? 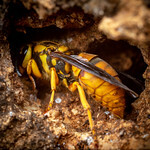 A personal blog by entomologist and photographer Alex Wild. 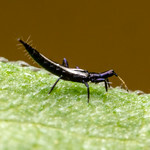 All text and images appearing on myrmecos.net, except where indicated, are copyrighted © 2002 - 2019 Alexander Wild.